There are so many cool adventures to have here that get over looked. Fishing or hunting is usually what draws people to Prince of Wales the first time, but suddenly they become aware of all the other things that are here. Theres more than one fisherman or hunter that have returned with their whole family so they could share in the excitement. After youve started fishing you start noticing all of the other things going on around you, its an explosion of life during the summer time. Everything feeds on something and here it happens in such abundance its mesmerizing to watch. Spring starts with the herring spawning, whales returning and all the birds coming to feed on the herring. Whale Fest kind of kicks off the activity in early spring, a low key event with fun events that mostly attract local participants. There are groups to kayak with, whale watching boats, poetry readings at the local Hill Bar, and different kid events. You can sign up to go out on one of the local boats or join in on the kayaking; they are free to participate in. This is fish egg weather so be prepared for anything because its all going to happen. From snow, sleet, rain and wind to calm sunny spring weather. Kayaking is an exciting activity from the devout adventurer to the entire family. This isnt a death defying sport or only for the expert. The estuaries offer an experience that will stay with you for a long time. The estuary offers a relative calm environment to slide across the flats and bays. 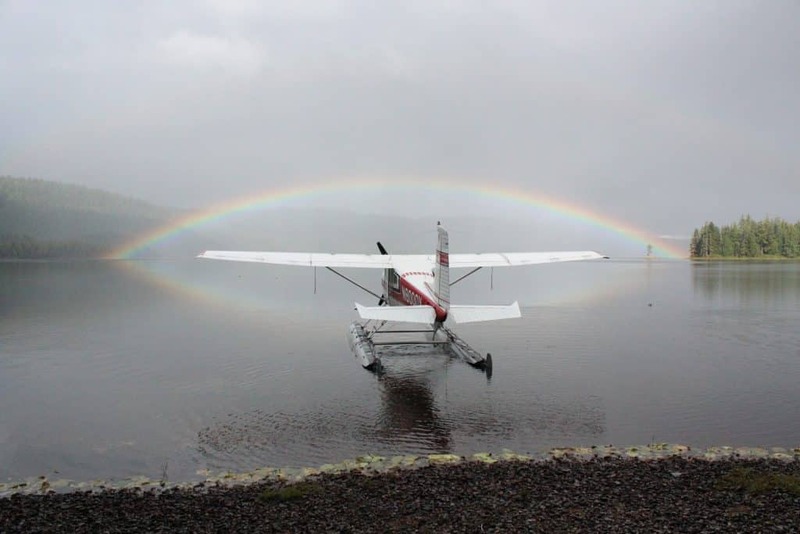 A great way to watch seals, birds, and bears along the shore. For the fisherman it never hurts to take your rod along and pick up a few fish as they leave the salt. When the salmon start to enter the rivers and creeks its a smorgasbord for everything from birds to bears. Bear watching never gets old and there are several places where you can find them feasting on salmon. Dog Salmon Fish Pass is a Forest Service viewing platform that you can drive to and watch the bears fishing. Its a great place to take a ride to, you might want to take your rod with you and check out 12 mile. One of our favorite places to watch and photograph bears is the Maybeso. 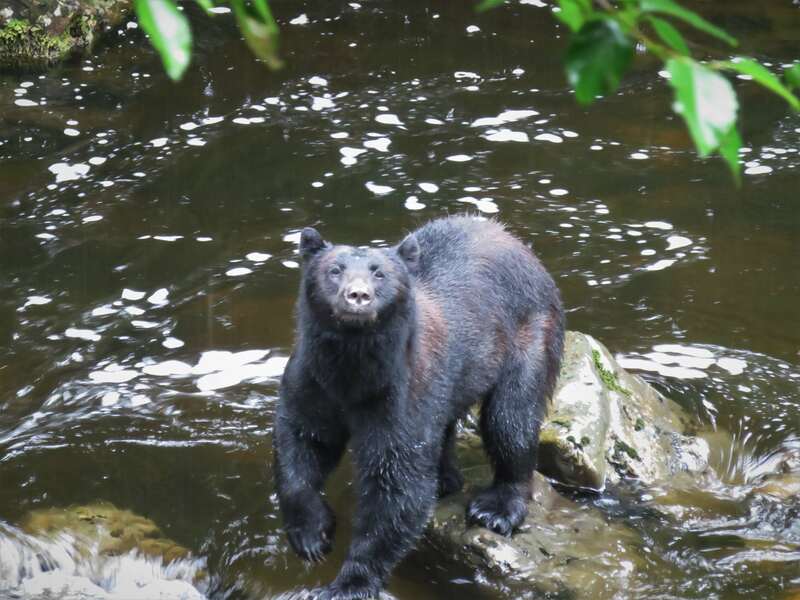 Anywhere there are salmon spawning there is a good chance bears are around. We have no Brown Bears on Prince of Wales, all of our Brown Bear photos were taken in other places. No one has been attacked by a bear here, so just use common sense. If you are nervous a great deterrent is bear spray. Watching bears from a kayak or boat is a lot of fun. Bears are frequently seen in the spring, cruising the beaches when they come out of hibernation, looking for goodies under the rocks. South East Alaska is known for its Totems, and Prince of Wales has the best Totem Parks and carving sheds. Klawock, Hydaburg and Kassan have some of the best carvers there are in Alaska. The various communities have Totem Raisings and if youre lucky enough to be here its a day well spent. The ceremony of raising the poles along with the drumming and singing is an unforgettable experience. There is a feast to celebrate the occasion followed by dancing. Dance groups come from all over South East and Canada to take part. There just arent words to describe the Grand entrance as the different dance groups come in. These events are a major ceremony for the community. There is a Blanket Dance at which time if you wish you can place a gift on the Blanket to help support some of the expenses of the Dancers. It is well worth checking into if there will be a raising during your visit, if not visit one of the Totem parks or Carving Sheds. Going for a road trip to see other parts of the Island is a great way to spend the day. You cant see everything in a day, but you can sure see a lot. Prince of Wales has some unique geology with its system of Karsts. The caves at El Capitan have tours that you can schedule through the Forest Service in Thorne Bay. You will need to call them ahead of time to arrange this. There is no way to call them from the North End. You can make a loop out of the road on the North end and also take in Beaver Karst and the Cavern Lake Trail and Creek in the same day. We drove past the Beaver Falls trail numerous times before we stopped and walked the loops. When you get there take a look or picture of the map so you take in the whole trail. This is a boardwalk and probably why we didnt stop there in the past. After walking the loop youll be glad its a boardwalk. Cavern Lake trail is really short and doesnt take long but really makes you wonder standing at the head of the Creek. Gold country always has its myths and half truths (or even a little less). Hollis was a gold mining town in the early 1900s for a short period of time. At present there are 2 working mines. One story goes that one of the miners working at the crusher on the Harris River was high grading some of the ore. When he saw a rich piece of ore he would put it in his pocket and then take it back and put it in a sack under his cabin. There was an accident at the mine and he was taken to Anchorage to recuperate. Well he never got better so he told a friend about the 19 sacks of gold under his cabin. This happened over a period of years so when his friend came to find the gold the mine was closed and the cabins long gone. Not responsible for any inaccurate information in this story. So it never happened or there are 19 sacks of gold out there somewhere. You might want to take a walk down the Harris River trail and do a bit of fishing or day dream about what if. Well if you need to burn off a little energy after spending so much time on the water you can head for the alpine. One Duck trail will take you up to a shelter and then you can go wander around the muskegs on top. There is also the Sunnahae Trail and get an overview of Craig and the Islands. Shopping opportunities are probably a lot different than you are used to, but there are some nice places to go. Log Cabin in Craig has just about anything you need for sporting goods and worth a stop. Strictly Local is in the shopping area with Papas Pizza and the Camo Shop. So whip in and get a shirt or hoodie with On Whiskey Creek, they already have it set up in their computer. While youre waiting for them to print, head into Strictly Local and see all the cool things that are made right here on Prince of Wales. Grab a pizza and youre good to go. Remember this is Alaska and if they dont have it, you probably dont need it.